Tanya Bierman, of Selby, found a miniature daffodil — a sure sign of spring — to take home from the Greater Napanee Garden Expo Saturday. Photo by Terry McNamee. Spring has been late arriving this year, but it was out in full force on Saturday for Communities in Bloom’s Greater Napanee Garden Expo. Held at the Strathcona Paper Centre, the event included more than 30 exhibitors along with a bevy of workshops. 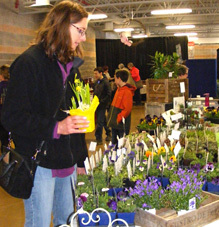 Booths provided educational information about planting, choosing plants and seeds, landscaping and overall garden care. Perfect weather helped ensure a good turnout. One of the exhibitors was Diane Irwin of Workshop Wizards. The pretty garden flowers she was selling didn’t need watering since they were made of steel and old cutlery. She also had a large display of pottery with garden-themed designs, and a selection of bird feeders. Irwin said her sales at the show were good. “I’ve sold out of the oriole feeders,” she said, adding that orioles will be returning to the area very soon. Her hand-welded steel flower and hummingbird garden ornaments also attracted a lot of attention, and her distinctive pottery received many compliments from visitors to the show. John Riedl of Frankford took some time out from representing the Quinte Botanical Gardens to discuss seeds and plants with Karyn Wright of Terra Edibles, located in Foxboro. They swapped tips on what plants would be ignored by two perennial garden pests: rabbits and squirrels. The consensus was that daffodils and tomatoes were safe to plant, but almost everything else was fair game for the little garden marauders! Another of the displays was by the Tamworth/Erinsville GrassRoots Growers. Steering committee member Michelle Mather of Tamworth said the group has guest speakers twice a year as well as hosting a spring plant sale, which this year will be on May 25 at Beaver Lake Lions Park in Erinsville. This group promotes interest in local and organic food production. Other displays were provided by local garden centres and greenhouses, specialist growers and seed producers, the Napanee Nature Conservancy, area garden clubs, producers of products such as edible greens, honey and preserves and representatives of a variety of community groups.